Exclusive opportunity to view this incredible condo residence located at The Towers of Channelside! Comfort and style intersect at this RARE 2161 sq. ft. 3 bed w/ an office 3 bath luxury condo on the 16th floor where the panoramic views of the Water Cruise Ships and Downtown are yours to enjoy each sunrise and sunset. This particular condo includes two secured parking spaces as well as a large storage unit. Interior features include three spacious bedrooms all with their own private on suite bathroom. The master has 2 large master walk-in custom closets and bathroom many dream about. Access the two wrap-around terraces (617 sq. ft.) from all bedrooms and the living room. 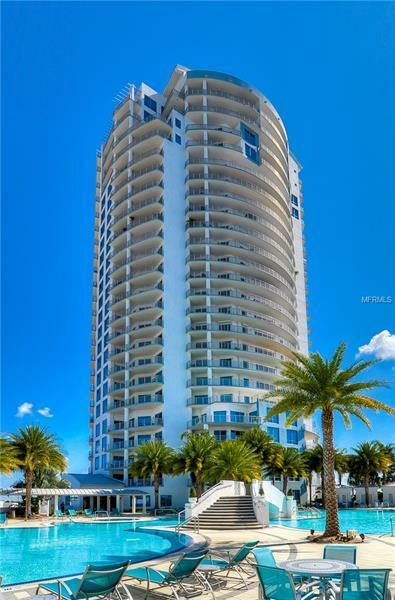 Recent luxury upgrades equip this high-end condo residence in Tampa Bay's most exciting area! Enjoy the benefits of living in a building with incredible amenities and service while relishing the privacy that accompanies a floor with few residences. Come be a part of one of the most luxurious high-rise communities Tampa Bay has to offer! Pet Restrictions: 2 pets maximum. Weight limit is 75 lbs. Certain breed restrictions. Verify restrictions with HOA.